On October 26, the moon swings to the northernmost point in its monthly orbit around Earth, and tonight, the moon shines near Elnath, the constellation Taurus’ second brightest star. 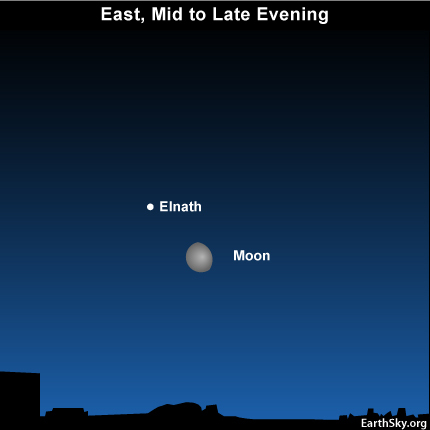 As seen from mid-northern latitudes, the waning gibbous moon and Elnath rise into the east-northwest sky around mid-evening. At middle latitudes south of the equator, the moon and Elnath rise by late evening or around midnight. The moon reaches its farthest point north of the celestial equator once a month. In contrast, the sun reaches its northernmost point but once a year. The sun’s farthest point north is frequently called the June (or northern) solstice. The moon’s northernmost point is sometimes referred to as a northern lunistice. After the moon and Elnath rise tonight, they will climb highest up in the sky during the wee hours between midnight and dawn. For the northern hemisphere, the moon will soar as high up as the summer solstice sun. However, in the southern hemisphere, tonight’s moon will ascend no higher than the winter solstice sun. Learn the star Elnath for handy reference. Whenever you see the moon close to this star, you will know that it is that time of the month when the moon is at or near the northernmost point in its orbit! 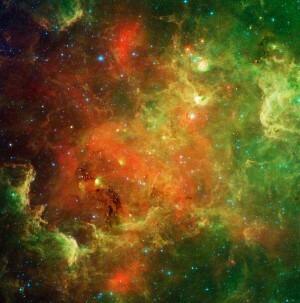 Looking for a sky almamac? EarthSky recommends . . .
Site contents copyright © 2019 Recorder Online	except as noted. All rights reserved. | 83 queries in 1.138 seconds.